Since opening in June 1923, Los Angeles Memorial Coliseum has become one of the world’s greatest sports venues, home to world-class athletes and legendary games. The Coliseum has also hosted numerous historic figures and countless special events. It is the only facility in the world to host two Olympiads (X and XXIII), two Super Bowls (I and VII), one World Series (1959), a Papal Mass and visits by three U.S. Presidents: John F. Kennedy, Richard Nixon and Ronald Reagan. The Coliseum will add to this illustrious record in 2028, when L.A. hosts the XXXIV Olympiad. The Coliseum was declared a National Historic Landmark on July 27, 1984. Los Angeles Memorial Coliseum is located at Exposition Park, across the street from the campus of the University of Southern California (USC). The Coliseum is adjacent to the former site of the Los Angeles Memorial Sports Arena, which is being replaced by the state-of-the-art Banc of California Stadium, the future home of the Los Angeles Football Club that is scheduled to open in 2018. Located about four miles southwest of Downtown L.A. off Exposition Boulevard and Figueroa Street, Exposition Park is also home to the California African American Museum, California Science Center and the Natural History Museum of Los Angeles County. Exposition Park will be the future home of the $1-billion Lucas Museum of Narrative Art. 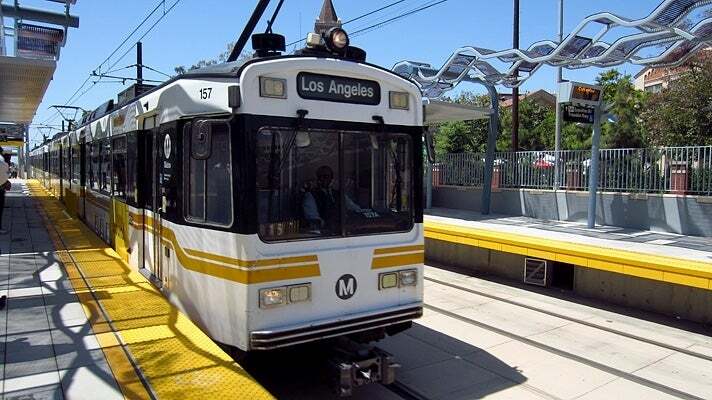 The Coliseum and Exposition Park are easily accessible from Interstate 110 (aka the Harbor Freeway) and the Expo Park / USC Station of the Metro Rail Expo Line. The Coliseum was designed by the father-son architectural team of John and Donald Parkinson. Other landmarks designed by the L.A. firm include City Hall, Union Station and the Bullock’s Wilshire Building. 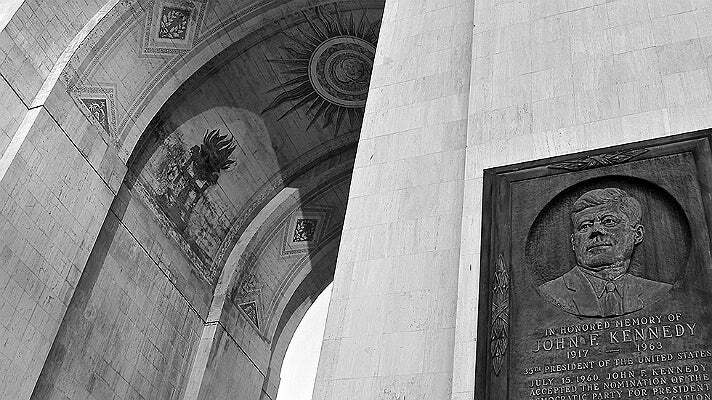 The Coliseum was commissioned in 1921 as a memorial to Los Angeles veterans of World War I; it was rededicated to all veterans in 1968. The official groundbreaking ceremony took place on Dec. 21, 1921 and work was completed on May 1, 1923. When the Coliseum opened in June 1923, it was the largest stadium in L.A. with a capacity of 75,144. The Coliseum is the home stadium of the University of Southern California (USC) Trojans football team. Established in 1888, the Trojans football program is a perennial National Collegiate Athletic Association (NCAA) powerhouse, claiming 11 national championships. 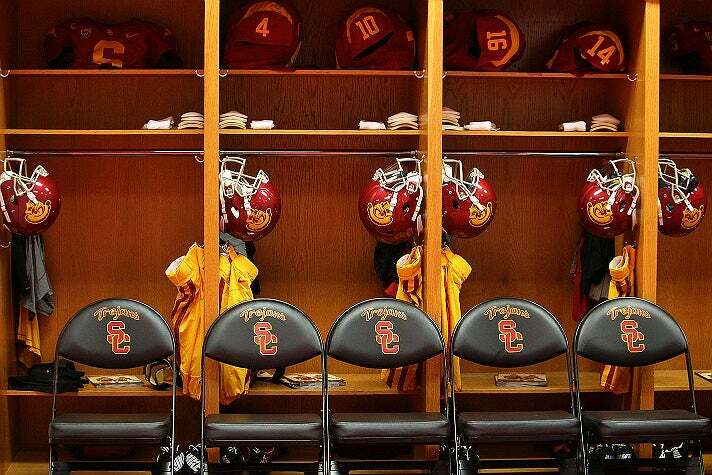 As of 2015, 493 Trojans have been taken in the National Football League (NFL) draft, more than any other university. USC is tied for first in the nation with the most Pro Football Hall of Famers (12). Five months after it opened, the Coliseum hosted its first football game on Oct. 6, 1923. 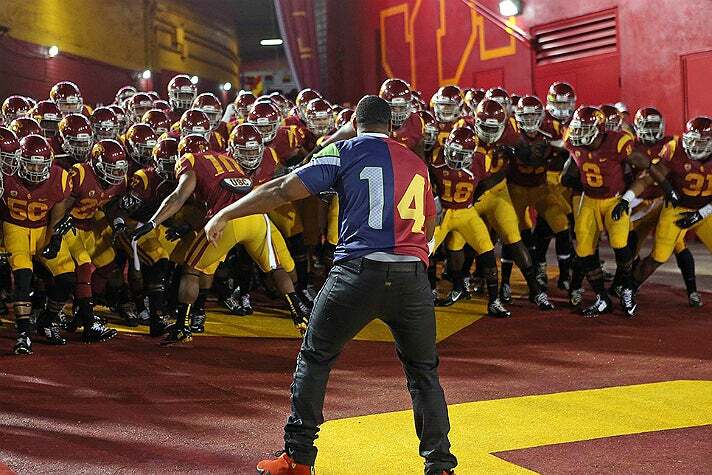 A crowd of 12,836 watched USC beat Pomona College 23-7. Many memorable games have been played on that field over the decades; one of the greatest was USC vs. Notre Dame on Nov. 30, 1974. Known as “The Comeback,” the Trojans erased a 24-point deficit and routed the defending national champion Fighting Irish 55-24. In 1946, the Coliseum began a long relationship with the National Football League (NFL) when the former Cleveland Rams relocated to Los Angeles. Kenny Washington broke the NFL’s color barrier when the Rams opened the season against the Philadelphia Eagles on Sept. 29, 1946. The team would play in L.A. through the end of the 1979 season, when the Rams lost to the Pittsburgh Steelers in Super Bowl XIV. The former Oakland Raiders later called the Coliseum home 1982-1994. 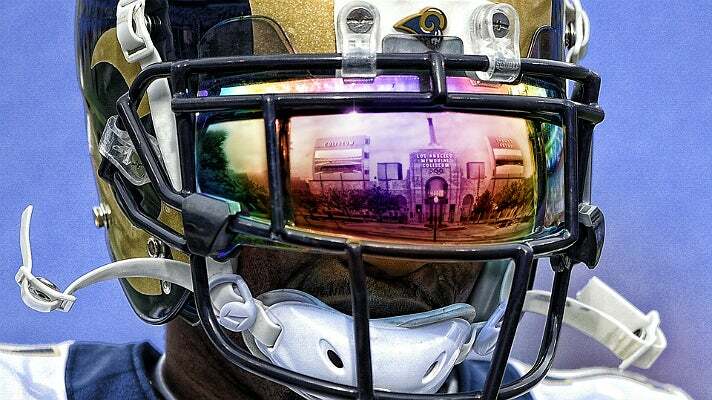 Beginning with the 2016-17 season, the NFL returned to L.A. and the Rams are once again the Los Angeles Rams. The Coliseum was the site of the first-ever NFL-AFL Championship Game, which took place on Jan. 15, 1967 and is now known around the world as the Super Bowl. The NFL champion Green Bay Packers defeated the AFL champion Kansas City Chiefs 35-10. The Super Bowl was played in L.A. for the second time when the Coliseum hosted Super Bowl VII in 1973, featuring the AFC champion Miami Dolphins and the NFC champion Washington Redskins. The Dolphins beat the Redskins 14-7 to become the first - and currently the only - team in NFL history to complete a perfect, undefeated season with a record of 17-0. The Coliseum hosted the opening and closing ceremonies of the 1932 Summer Olympic Games. The stadium was also the site of field hockey, gymnastics, the show jumping part of the equestrian events, and track and field. In anticipation of the Olympic Games, the Coliseum’s capacity was increased to 105,574 seats. The famed Olympic Cauldron (aka the Olympic Torch) was added to the peristyle on the east end of the stadium, as well as the Olympic rings, which were placed over the main center entrance of the peristyle. Today, the torch is lit during the fourth quarter of USC football games, as well as other special occasions (e.g. when the Olympic Games are being held in another city). 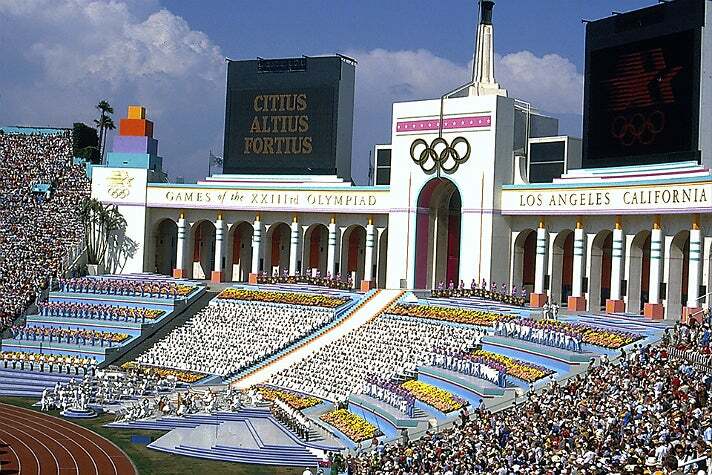 In 1984, Los Angeles became the only U.S. city to host two Olympics, and the Coliseum became the first stadium to host the Olympics twice. For the 1984 Olympic Games, the Coliseum was the primary venue for track and field, and the site of the opening and closing ceremonies. The Olympic Gateway, created by sculptor Robert Graham for the '84 Games, is notable for a pair of life-sized bronze nudes modeled on two Olympic athletes, U.S. water polo player Terry Schroeder and Guyana long jumper Jennifer Inniss. 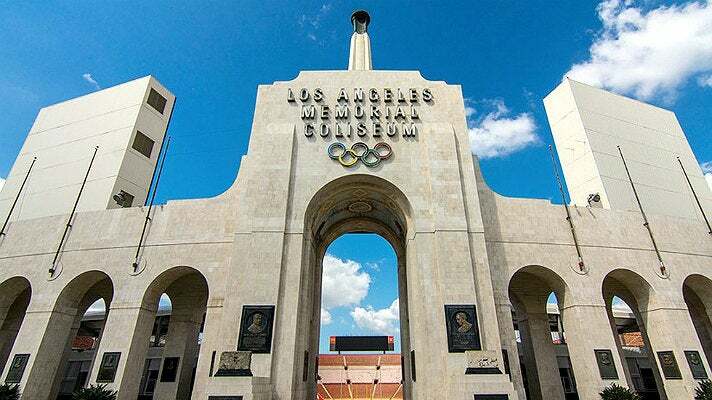 Along with the Los Angeles Stadium at Hollywood Park, the Coliseum will co-host the opening and closing ceremonies of the 2028 Summer Olympic Games. The Coliseum has hosted decades of spectacular concerts featuring some of the greatest music acts in history, including Roger Waters performing “The Wall” in its entirety; the Rolling Stones “Steel Wheels” Tour with Guns N’ Roses; U2, Metallica, The Who, the Grateful Dead, Van Halen and many more. Bruce Springsteen & The E Street Band concluded their Born in the U.S.A. Tour with a four-night stand at the Coliseum on Sept. 27, 29-30 and Oct. 2, 1985. The shows were recorded and eight songs from the Sept. 30 concert appear on their 1986 box set, Live/1975–85. The Sept. 30 performance of Edwin Starr’s War was released as the first single from Live/1975-85. The music video is a straight concert filming of the Coliseum performance. USC vs. Notre Dame: The 1947 edition of the rivalry game was seen by a crowd of 104,953, the highest attendance for a football game at the Coliseum. The Fighting Irish defeated the Trojans and went on to win the National Championship. World Series: During the 1959 World Series against the Chicago White Sox, attendance at all three Dodgers home games exceeded 90,000. Game 5 drew 92,706 fans, a World Series record that will likely remain unbroken. 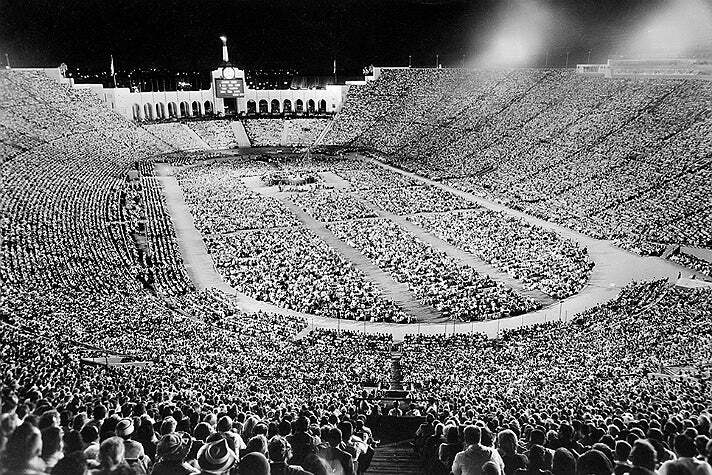 Billy Graham Crusade: Evangelist Billy Graham’s 1963 Southern California crusade was held at the Coliseum Aug. 15 - Sept. 8, 1963. On the final night, a crowd of 134,254 attended the service, which is still an all-time Coliseum record. RBD: A new mark for the highest paid attendance for a Latin music concert in the United States (63,101) was set on March 18, 2006, when Mexican pop group RBD took the Coliseum stage. Soccer International Doubleheader: On Aug. 6, 2006, the Coliseum hosted an international doubleheader featuring Chivas USA vs. the New England Revolution and Chivas de Guadalajara of Mexico vs. FC Barcelona of Spain, the reigning Spanish and European champions, respectively. According to MLS Soccer, the standing room only crowd of 92,650 fans was the largest in MLS history and the largest to witness a professional club soccer event in the United States. Dodgers 50th Anniversary: An exhibition game on March 29, 2008 celebrated the 50th anniversary of the Dodgers in L.A. The Dodgers lost to the Boston Red Sox, 7-4. The crowd of 115,300 set a new Guinness World Record for attendance at a baseball game. Located at the historic Coliseum peristyle, the plaques that comprise the Memorial Court of Honor commemorate outstanding persons or events (athletic or otherwise) that have made an impact on the Los Angeles Memorial Coliseum. In 2015, the Coliseum opened its doors to host public tours for the first time. Visitors have two options for the Coliseum Historic Tour. The Self-Guided Tour is available 10 a.m. - 4 p.m. Wednesday-Sunday. There is no time limit on this tour, but access is limited to the Olympic Arches, Peristyle and Court of Honor with a view of the playing field. The docent-led Guided Tour includes the Olympic Arches, Peristyle, and Court of Honor, as well as access to off-limits areas such as the USC Recruit Lounge, Press Box, Home and Visitor Locker Rooms, and the Player's Tunnel. All destinations on the docent-led tour are subject to availability. Please note that there is no access to the field. Comfortable shoes are strongly recommended. Guided Tours are offered at either 10:30 a.m. or 1:30 p.m. Wednesday–Sunday and last about 90 minutes. Tickets to the Coliseum Historic Tours are available to purchase online at Ticketmaster or on a walk-up basis at the Coliseum Historic Tour Box Office located at Gate 28C. All Coliseum Historic Tours depart and conclude at Gate 28C. Self-Guided Tours are priced at $10 Adults / $5 Seniors and Military. Guided Tours are priced at $25 Adults / $20 Seniors and Military. Kids age 5 and under are free. To schedule a Private or Group Tour, email colitour@usc.edu. In October 2015, USC announced preliminary plans to renovate and restore the Los Angeles Memorial Coliseum. The $270-million renovation is part of USC’s long-term lease agreement. Construction is scheduled to begin after the 2017 USC football season and be completed for the 2019 football home opener, without impact to the 2018 season. 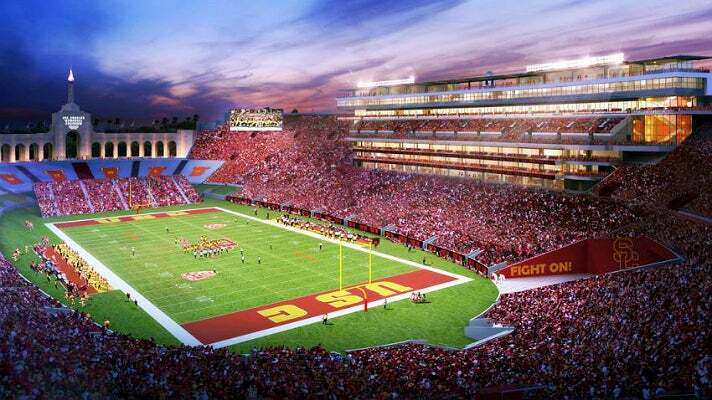 The renovation will be funded entirely by USC Athletics from capital gifts, sponsorship revenue, non-USC events at the Coliseum and donor naming opportunities. It will not require any student fees or general university, local, state or federal funds. Updating Wi-Fi technology throughout the venue. Improving audio and video, including two new large screens at the east end of the stadium. Adding new concession stands and improving existing stands.